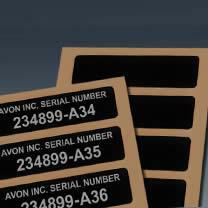 MPC's AlumaMark BlackPLUS Blank Labels and Tags are the most durable solution for use with YAG and Fiber lasers. The black background is sealed beneath a sapphire-hard anodic layer that provides an impenetrable surface, and expected exterior life of 20+ years. Why Choose MPC's AlumaMark BlackPLUS Blank Labels & Tags? Imaged on a photosensitive anodized aluminum face stock. After fabrication, edges and holes of the finished parts are not anodized; a secondary process may be elected for thicknesses of .063" or greater to anodize, alodine or paint these edges for increased durability and protection. Photosensitive anodized aluminum face stock (optional thicknesses .003", .005", .008", .012", .020", .032", .063", .090", .125").